Eggs are prominent in Portuguese cuisine. 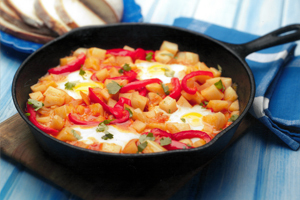 Here they top a skillet dish of potatoes, onions and sweet pepper that is good for brunch or a light supper with a crisp green salad. In large skillet, heat oil over medium heat; cook onion until wilted, about 5 minutes, stirring often. Add red pepper; cook for 3 minutes, stirring occasionally. Stir in garlic and potatoes, to coat with oil. Stir together water, tomato paste and piri-piri; stir into potato mixture. Reduce heat, cover and cook until potatoes are tender, 20 to 25 minutes. Season with salt and pepper to taste. Increase heat slightly. Break eggs, one at a time, into cup and slip into skillet on potato mixture, spacing evenly. Cover and cook until white is set, about 5 minutes. Sprinkle with coriander.